After visiting Bushwick Open Studios on Sunday, I was standing on Bogart Street, talking to an acquaintance who had been peddling art on the sidewalk, when an unmarked police car stopped beside us. An officer leaped out of the car in pursuit of a girl in sunglasses who was drinking something out of a brown paper bag. “Is that alcohol you’re drinking?” he asked. “No, it’s cider,” she said. “Can I see it?” he asked. 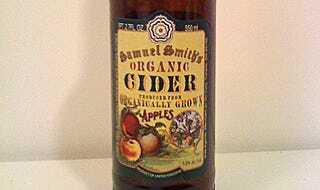 “Sure,” she said, and pulled out a bottle of Samuel Smith’s Organic Cider, 5% alcohol, whose distinctive label is shown above. “OK, sorry to bother you,” he said, then got back in his car and drove away. Image via Wikipedia. Contact the author at andy@gawker.com.